Reducing plastic waste in the meeting industry – Sea to Sky Meeting and Association Management Inc.
As professional meeting planners, we all know the influence we have on our client’s purchasing decisions and on the venues we contract with. By pushing to keep green strategies at the forefront of the planning process, we can have significant control over the amount of waste outputted as a result of our event. No bottled water – this one is a no brainer. By simply asking the venue not to put plastic water bottles on any beverage station or bar, you save money and be pleasantly surprised at the positive response you receive from attendees. 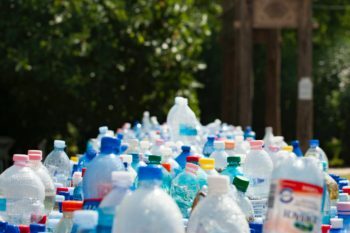 The movement towards eliminating single use plastics is gaining momentum and things like plastic water bottles and straws are viewed as unnecessarily wasteful. People are taking notice and are appreciating the effort made to offer more sustainable options. Most venues offer tap water service with glassware free of charge. And don’t forget to nix the plastic straws. Recycle soft plastic packaging – At a recent event at the Fairmont Banff Springs, we distributed several give away items that were each individually wrapped in their own plastic sleeve, resulting in literally thousands of little plastic baggies going to waste. I was pleased to learn that this venue recycles soft plastics. With one quick call to the banquet department, I had several large recycling bins which I labelled as ‘soft plastic only’ and had a volunteer collect up all the plastic packaging. Coffee / tea service – Ask the venue not to put out any disposable coffee cups. Often venues put out both ceramic and disposable cups so attendees can choose their preference. Simply ask the venue to forgo the disposable cups and provide only upon request. ‘Waste Patrol’ for exhibitor move in and move out – The tradeshow can be the largest waste producing component of your meeting. While you have little control over the amount of packing and waste products brought in by each exhibitor, I suggest working with the venue to set up a clearly labelled and comprehensive recycling and sorting area in the exhibit hall for move in and move out. Why not have a little fun with it and create a volunteer role entitled ‘Waste Patrol’ (with special t-shirts and all). This job would entail visiting each exhibitor to offer assistance with taking the waste products to the recycling and sorting area. This won’t cost the meeting a penny and your exhibitors and sponsors will appreciate the effort. Finally, one thing I always ensure to include in any venue RFP is a request for a detailed description of the venue’s recycling / waste reduction programs. This lets the venue’s sales team know their initiatives on environmental responsibility will be a consideration when making the final selection. In addition, once the venue is selected, I request a ‘back of house’ tour of the ‘green’ facilities which helps keep them accountable. If you are going to implement waste reduction strategies into your meeting, why not let your attendees know – highlight these initiatives in a marketing email or add a tab in your Conference App called ‘Going Green’ that talks about the different strategies taken by the event organizers to reduce the event’s waste output. You never know – this may be a factor in deciding whether they attend your event again in the future. With the social conscience in North America shifting towards eliminating all single use plastics, we have an opportunity to impress our attendees through our commitment to the environment. Next in line is paper, cardboard and energy use… Simple strategies like this can be taken to reduce our carbon footprint while not compromising the budget. It’s a win win!